North and South Korea have agreed to form their first joint Olympic team and will march together under a unified flag during the opening ceremony, South Korea has announced. 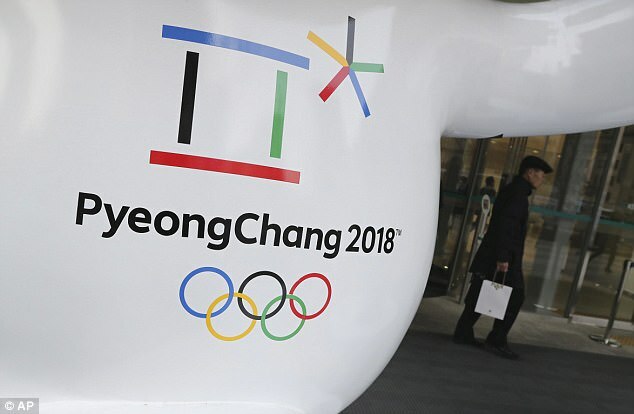 The two Koreas agreed to form a combined women's ice hockey team to take part in next month's Winter Olympics in PyeongChang in the South next month. Seoul's Unification Ministry says the agreement was during talks on Wednesday at the border village of Panmunjom. It said athletes from the two Koreas will march together under a 'unification flag' depicting their peninsula during the opening ceremony. The measures require approval by the International Olympic Committee. 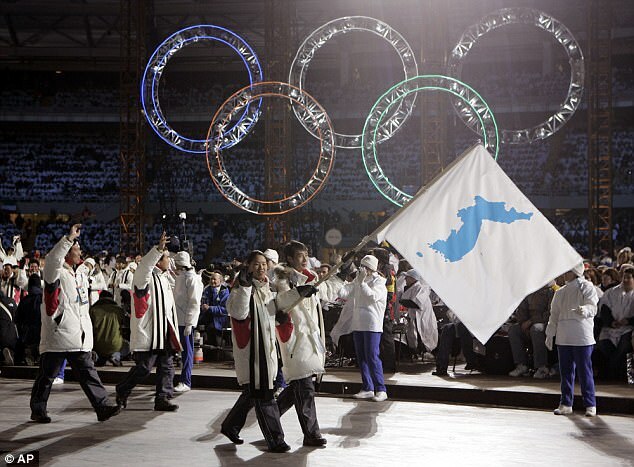 The South Korean ministry added the two Koreas will consult with the IOC this weekend. North Korea will send a delegation of about 550, including 230 cheerleaders, 140 artists and 30 Taekwondo players for a demonstration, the statement added. The delegation is scheduled to begin arriving in South Korea on January 25. North and South Korea have been talking since last week - for the first time in more than two years - about the Olympics. It has offered a respite from a months-long standoff over the North's missile and nuclear programmes, which it conducts in defiance of U.N. sanctions. The two Koreas have been pressing ahead with a flurry of projects to cooperate in the Olympics since North Korean leader Kim Jong-un abruptly said in a New Year's speech that he was willing to send a delegation to the games. 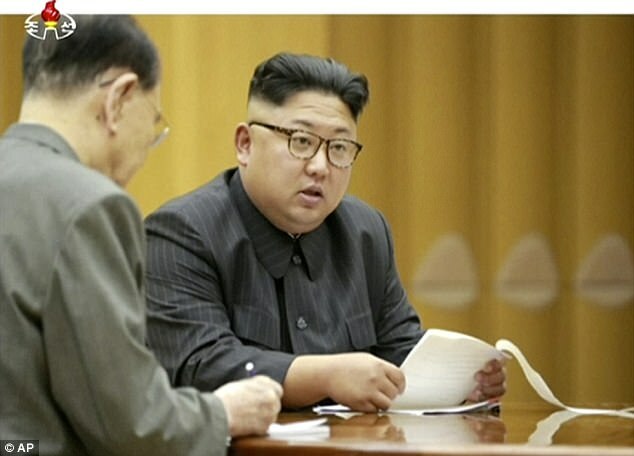 Critics say Kim's overture is an attempt to use improved ties with Seoul to weaken U.S.-led international sanctions on the North while buying time to perfect his nuclear weapons program. 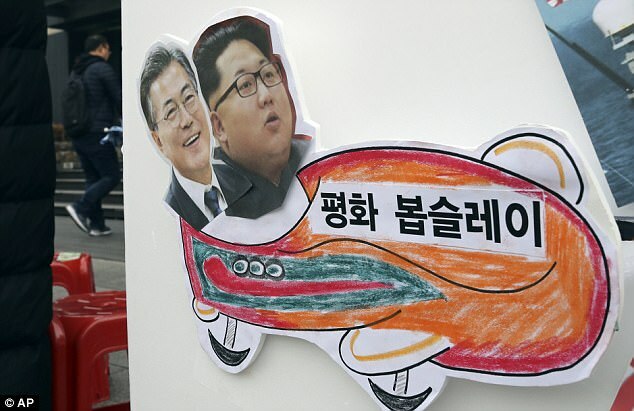 But the moves nevertheless have provided a temporary thaw in the Koreas' long-strained ties and fostered optimism that he North won't launch any new provocations, at least during the Olympics. South Korea's president previously announced his support of a proposal for the rivals' first unified Olympic team. The North's participation in the Olympics 'will serve as a chance to warm solidly frozen South-North ties,' President Moon Jae-in said during a visit with South Korean Olympic athletes. "Their athletes will march together under a [Korean} unified flag at the opening ceremony"
One Korean People; two political divisions. GERMANY Reunited now it is Korea's turn.